The range of the hooded merganser is Alaska to Nova Scotia, British Columbia, the U.S.A. except southwestern states. 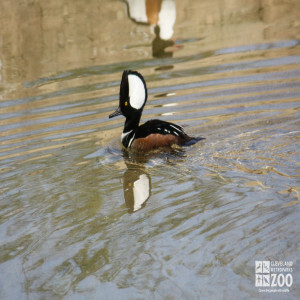 Hooded mergansers prefer wooded habitats that contain clear-water streams or clear lakes. Usually seen in pairs or small parties, hooded mergansers are less sociable than most diving-ducks. Their flocks rarely exceed 15 birds. Pair formation begins in mid-winter. Mergansers feed by diving. They fly rapidly, low over the surface of the water, taking off with some spattering over the surface. They are very agile while flying through the trees. They are migratory, but often remain until force to move by freezing waters. Female hooded mergansers frequently reoccupy the nest site of the previous year if it is still available. They prefer to nest in tree cavities along secluded woodland ponds and streams. When incubation is underway the males desert the females to commence post-breeding molt. Females move their newly-hatched ducklings out of the nest within a day of hatching, and usually go to shallow waters close to timber. The fledging period is about 70 days. It is uncertain how long the female remains with her brood.